A Taste of Fire Island gives you the chance to sample some of Fire Island’s best restaurants at very low prices. $48/person pays for dinner, round trip ferry ride, and parking at the ferry terminal. 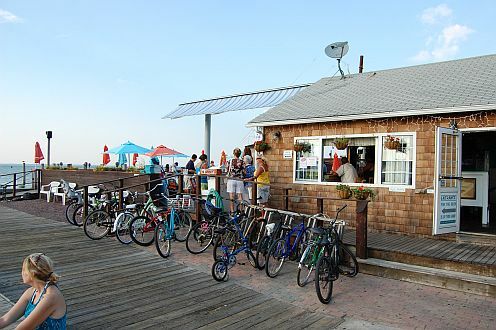 Every summer Fire Island Ferries teams up with a handful of restaurants in Ocean Beach to promote midweek tourism and dining on Fire Island. The result is the popular Taste of Fire Island package which is one of the least expensive ways to enjoy dinner on Fire Island. 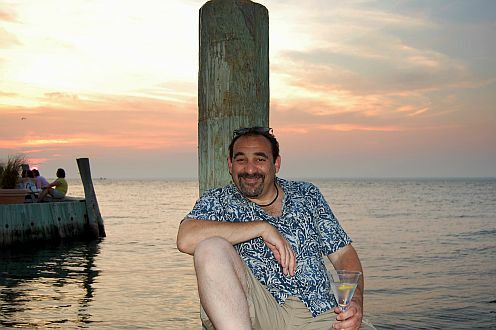 I’m talking about dinner at a table overlooking the bay with a full view of the setting sun. Add a pint of beer, glass of wine, or your favorite cocktail and it’s the closest thing to heaven you’ll find here on Earth. The view from our table at Island Mermaid. The deal works like this: Every Monday through Thursday from July 9 until Labor Day you pay $17/person for round trip ferry tickets (that’s $1 off the usual fare) and $30/person at the restaurant. At the ferry ticket booth they validate your parking stub to waive the usual $8 parking fee. Each restaurant has a special menu for the Taste of Fire Island package. The typical offering is 2 choices for the appetizer, anywhere from 5 to 10 choices of main course, and 2 choices for dessert. Drinks are not included in the package. I’ve heard some good things about Island Mermaid and I’ve enjoyed some of their bar food in the past, so that’s where we decided to go for our first Taste of Fire Island experience. It’s hot and noisy inside the ferry. And there’s no ventilation until the boat starts to move. Next time we’re showing up on time. We made a reservation for 6pm on a Thursday night and took the 5:35 ferry which we made by the skin of our teeth. We parked, got tickets, and boarded the boat. But since we were late, we rode inside instead of on top. Ugh! 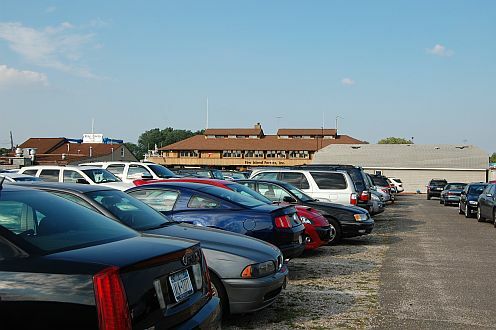 One of several parking lots at the Fire Island ferry terminal. The next boat out is the 6:50 which would get us there in time for a 7:30 reservation, but since this was a work night I wanted to start out early. The other advantage to taking the earlier boat is that you have a better chance of getting a spot in the parking lot. If the lot’s full, you have to park on the street. Outdoor seating on the bay at Island Mermaid. The ferry arrived at 6:05 and we walked about half a block from the ferry terminal in Ocean Beach to the restaurant. BTW, all of the restaurants in Ocean Beach are within a short walk of the ferry terminal, so you don’t have to worry about transportation or walking long distances. We were seated immediately and ordered a couple of beers to cool us off while we checked out the menu. Our appetizer choices were french onion soup or a salad. It was too hot for the soup and I was starving so I wanted something else in addition to the salad. 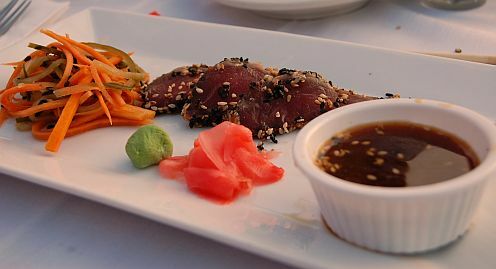 I ended up having an excellent tuna tataki appetizer from the regular menu. This really hit the spot and was not overly filling. Items from the regular menu are billed accordingly and don’t affect the Taste of Fire Island deal. Just be prepared for a little extra on your bill. Drinks are not included either, so if you’re doing this to save money you might want to have soda or water instead. Between beer, a couple of martinis and a glass of wine our bar bill was almost $53. This was not unexpected. 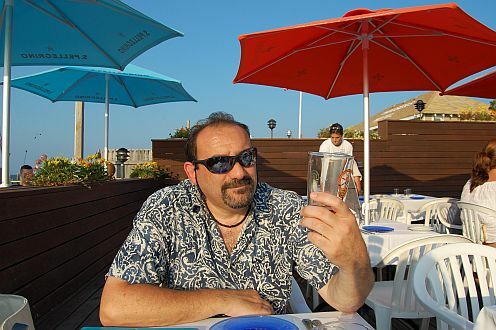 I wanted to try the Taste of Fire Island just to see how the food, service and crowds would be. I was entirely set on having fun and spending more than just a hour at the table for an eat and run bargain. In fact we spent about three and half hours at the table and had a great time. Hmmm. Must be time for a martini. The beer cooled us off and quenched our thirst. And the martinis were savored for a good long time with the tataki and salad before we ordered our main course. Mother nature did her part by providing a cool breeze and pretty sunset. Island Mermaid has a dock for people who come by boat and in between courses we hung out on the dock enjoying views of the Great South Bay and the setting sun. Choices for the main course were many and included fish, pasta, poultry and fowl. I ordered duck and Karilyn had a skirt steak. Both were very good. By the time we got to desert we were both full, but it’s included in the price so we dug in. I had cheese cake and she had the berries, both of which were as good as the main course. Lights on Fire Island glisten behind us while the crew collects tickets. When they finished the deck lights went out and we rode home in the dark. A peaceful, quiet, beautiful dark. We finished up at around 9:30, just in time to get in line for the 9:40 ferry back home. And after riding inside on the way there, we made sure to get in line early enough to enjoy a topside ride on the way home. We had a great time. 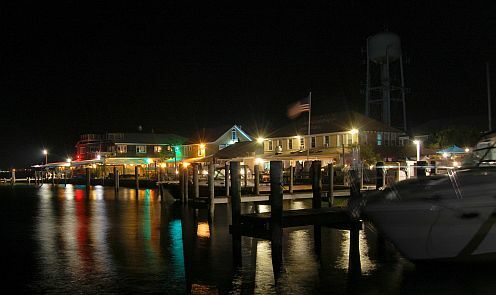 The Taste of Fire Island is a great midweek break at a great price. You can enjoy a nice ride on the ferry, views of the bay, a beautiful sunset, and a good meal for about the same price you’d pay on the mainland. The food and service were good, and even though the restaurant was nearly full to capacity neither staff nor kitchen seemed overwhelmed. We stayed for well over three hours and never felt as though we were being rushed to leave. My overall impressions of the Taste of Fire Island package are positive and this is something we’ll be doing again before summer is out. Mathew’s, The Hideaway, and Island Mermaid on the far, far right. Take the 5:35pm boat to assure a parking space. Tell the parking attendant and ticket clerk you’re here for the Taste of Fire Island. 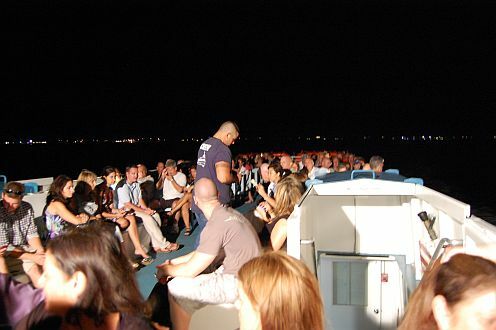 Arrive early so you can ride on top of the ferry instead of inside. Remember to validate your parking stub at the ticket counter. Make you’re reservation a day or so in advance. 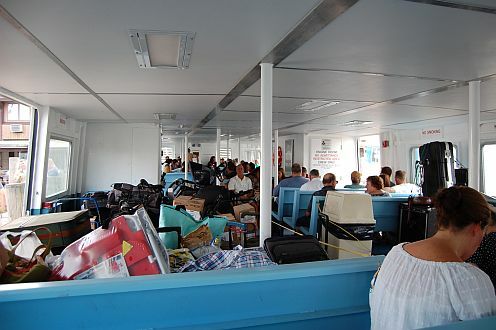 Everything you need to know about riding the Fire Island Ferry. 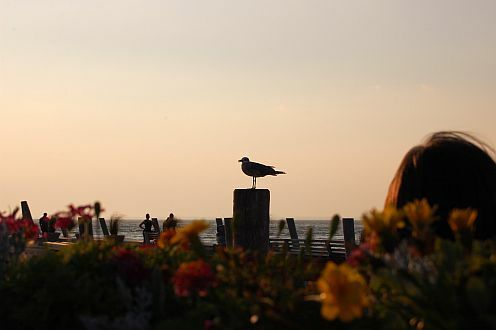 More things to do on Fire Island and in Ocean Beach.